CHARLOTTE MINICON UPDATE :: DOOR PRIZES AND MORE! If you’ve been to the Charlotte MiniCon before, you know we always have cool door prizes that any attendee can win. Sometimes, though, Shelton throws some especially exciting and valuable items into the mix. This year is a prime example of that. Along with passes to HeroesCon, t-shirts, prints, and some of the other awesome items you might be expecting, this year’s door prizes include some highly sought after books like those pictured above. Look closely and you’ll see copies of the San Diego Comic Con variant for Walking Dead #87, and a variety of covers for the now sold out Amazing Spider-man #700, including the regular cover, variants by Olivier Coipel and Marcos Martin, and even a copy of the super hard to find Steve Ditko variant. If you look on ebay right now, the Ditko variant has been selling for between $800 and $1200. That’s right, Shelton’s offering up a $1000 comic book as a door prize this year! That should give you an idea of how much fun Charlotte MiniCon will be this year. Remember to “Like” us on Facebook and then register for your FREE Mini-Con pass! Print your pass and bring it to the convention to speed your entry into the con. All attendees will receive a door prize ticket upon entry. Amazing door prizes will be given away all throughout the day, so get in early and stay all day! You never know when your number might be called! Charlotte MiniCon is Sunday, January 20, 2013 at The Grady Cole Center from 11am to 5pm. There is plenty of free parking! 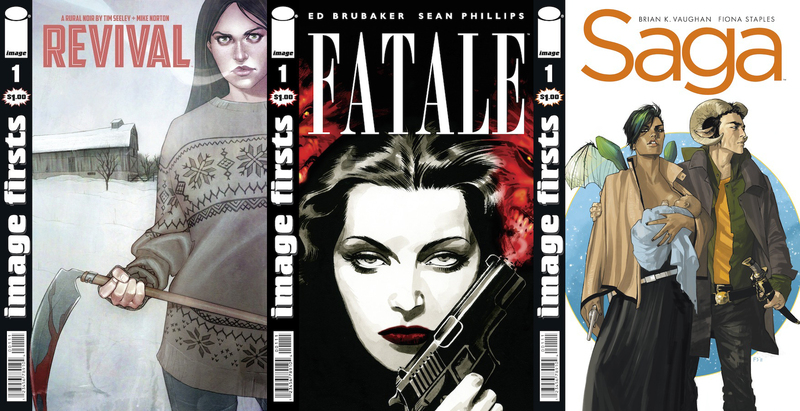 RICO’S PICK :: IMAGE FIRSTS: Dollar comics! Brand new dollar comics! 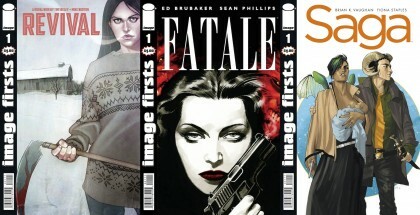 Image Firsts are new printings of the 1st issues of some of Image’s best books. CHEW, FATALE, MANHATTAN PROJECTS, REVIVAL, SAGA and a few more are being offered this week at a low $1 cover price. This is a great time to try a series that you’ve been hearing about without making a big investment.